March was Self-Injury Awareness Month, which is a time reserved each year to increase awareness of teenage self-injury, and help teens who suffer from this harmful compulsion to feel supported enough to seek help. While March is a month dedicated to awareness and support for those practicing self-injury, this is a condition that can impact your teen any time of the year. As the parent of a teenager, you undoubtedly want your teen to be safe and healthy as they continuously grow and mature toward adulthood. Teens who self-injure often do so to achieve an emotional release from feelings of stress, anxiety, sadness, or rejection. While self-injury is not an attempt at suicide, it can have lasting mental and physical health implications is left untreated. What are signs my teen might be hurting themselves? Due to feelings of fear or shame, most teenagers will not usually come forward or seek help for their self-injury habit. However, there are some signals and symptoms of this harmful disorder that you can know and recognize to help keep your teen safe from themselves, and intervene should you discover they are harming themselves. 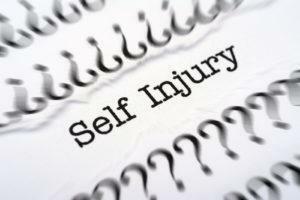 How can I help my teen if I suspect they are practicing self-injury? Don’t wait for your teen to come to you. Bring up the topic yourself, and express love and support for your teen. Listen to your teen, and encourage them to speak openly with no fear or shame. Let your teen know they are not alone and that they can get better, and offer options for helping them overcome self-injury actions. While self-injury is not typically an attempt to commit suicide, teens can easily take their self-injury too far, and seriously harm themselves. It is very important that you seek professional help for your teen if they continue to injure themselves after you’ve intervened and tried to help as a parent. A professional counselor or therapist can help you both deal with your emotions, and get back to leading a healthy, safe life.